A vaulted ceiling in this Great Room Floor Plan proves that a vaulted ceiling gives a more open feeling to this country Log home plan. Divided bedrooms, each with its own bath, offer privacy when grandchildren visit. The Great Room can have a vaulted ceiling for a more open feeling. An eat-in kitchen has a small pantry. The washer/dryer are located within the master bath which has a separate vanity. Rear doors or windows open to a deck that takes advantage of your special view. 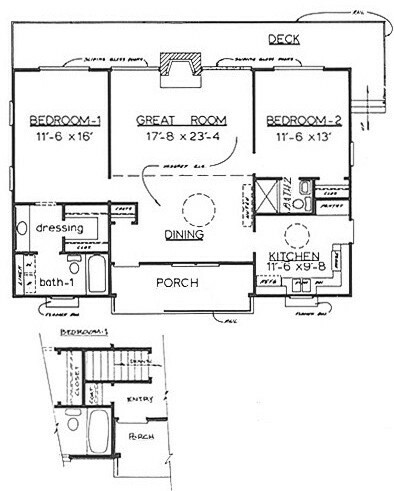 Included in plan is an alternate plan for stairs to a basement. 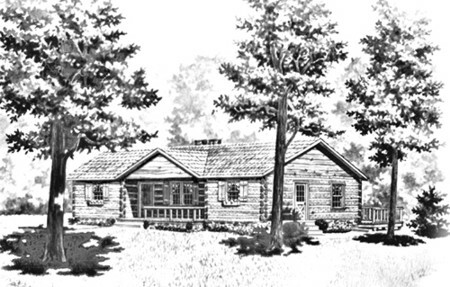 This Log Plan is designed using chinked, pine 6x12 dovetail logs, but other types of logs may be used. 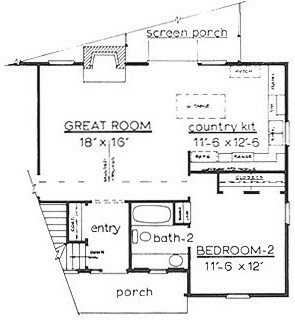 Included in the purchase of the basic Log Plan L-1104, is the alternate Frame plan, F-1104-A, which reverses the kitchen and Bedroom-2, making Bath-2 a private bathroom. The great Room is open to the spacious kitchen that has room for a long harvest table. Family dining can extend onto the large rear screen porch when the weather is mild. A basement stairway to a full basement is near the front entry.